Whether you run a small or a big business, customer complaints and inquiries are an integral part of operations. In fact, your business relies on it. Servicing your customers well means you value their patronage and if they feel taken care of, they will be loyal to you. On the other hand, bad customer service can be damaging to any business. This may take the form of inquiries or complaints not getting answered, or worse, customers being treated disrespectfully by your customer care staff. More and more people are starting to feel that human intervention for answering customer complaints and inquiries is a double-edged sword. For one, interacting with a fellow human may give the customer a more “humane” service, but there are also a lot of uncontrolled factors, like human emotions and error. This is why companies and brands are starting to install chat bots who can engage with multiple customers easily and efficiently. What exactly is a chat bot? Simply said, it is a service that performs automated commands or replies, powered by rules or an artificial intelligence. People can interact with them using a chat interface like Facebook Messenger and even text messages. And do you know that this year, the usage for messaging apps have surpassed the usage for social networks? That means people all around the world are now regularly engaged with one another and brands via messaging apps. More and more people are starting to prefer messaging a Facebook page about a product inquiry or complaint instead of calling or sending an email. And who wouldn’t, right? Typing a few words takes less effort than opening your email and sending an actual email to inquire or complain about something. This makes engaging with customers difficult for some businesses who need to reply non-stop to messages in social media. Thus, there was a demand for automated responses, especially for basic and frequent inquiries. And what better way to answer these than chat bots, which can reply to multiple customer inquiries all at the same time? Aside from customer service, chat bots can also perform a variety of tasks. There is a weather bot that allows you to get the latest weather report. There is also a grocery bot that helps you pick out and shop groceries from the comfort of your own home. There is a news bot that tells you breaking news. There’s also a schedule bot that acts as a personal assistant who schedules meetings for you. In China, they even have a chat bot called Xiaoice which is kind of like a friend bot. Banks overseas are also starting to use chat bots to assist their customers with simple inquiries like a customer’s current account balance or how to open a new account. E-commerce websites are also taking advantage of this trend. Imagine the experience of shopping by simply typing in your Facebook messenger. Big brands like Uber has also made it possible to book a ride via Facebook chat. The possibilities seem endless. It’s like having a personal assistant you can chat with and never complains, despite your continuous commands. Chat bots may seem like they can only give robotic replies but they can also have personalities. The weather bot Poncho acts like a friend and even shares personal (albeit made up) details about himself. Disney also made use of chat bots when promoting their film Zootopia. Whenever you message the Facebook page of the movie, the main character named Judy Hopps will answer you. The way she answers your question is of course based on her personality in the movie. Giving chat bots a personality makes the interaction with them feel less robotic and more human. 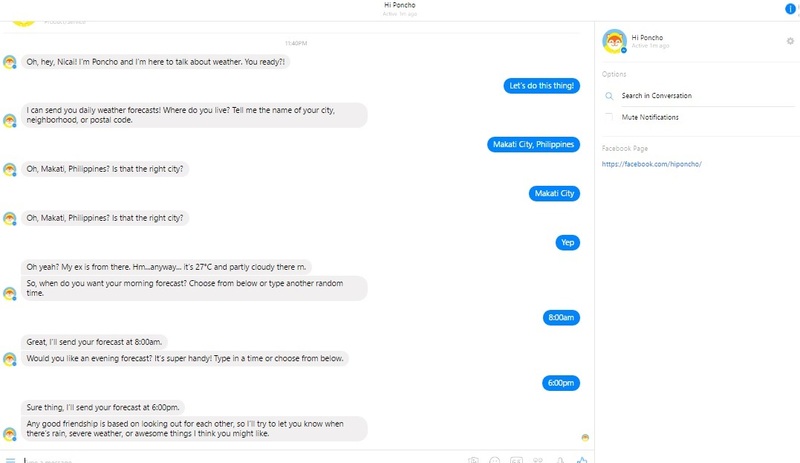 Not many brands in the Philippines are taking advantage of the chat bot revolution. Maybe the country hasn’t caught up with the trend yet and maybe it is also an administrative decision to continue using contact centers instead of artificial intelligence to engage with customers. The country’s culture can also factor in with the adoption of this kind of technology. Filipinos may prefer the warm response of an actual human than the automated replies of a robot. Another factor is that not a lot of local tech players are enabling brands and businesses to install or develop chat bots for their social media’s messaging feature. But who knows? Maybe next year, big businesses will consider the use of chat bots for customer engagement as it saves them time and budget due to the volume of answered queries, which eventually lead to sales or resolved issues. One chat bot already equals a work force, after all. And maybe next year, big tech players and digital agencies will start offering the development of chat bots for big companies and SMEs.